First, I want to note what it says on the front of the bottle: “Extra Dry Gin with Lime Liqueur.” Basically they take their main gin offering, and infuse it with a lime liqueur. Interesting, seeing as how as far as I’ve tasted, there are not many lime spirits out there. Lime and gin go together quite naturally, so let’s see how this spirit brings it all together. Strong with a cloying character, it reads clearly as somewhere between lime rind and lime candies. The finish has a moment where that signature dry note comes through, but the lime note lingers, never quite reaching a crescendo of heat, but one where the sour tang lasts long into finish. Seagram’s Lime Twisted Gin was designed for mixing. The gin and tonic is a natural fit. With the lime added right into your gin, you don’t need to add lime to your G&T. If you do, you might not even be able to taste much of the citrus over the loud citrus of the gin itself. An okay gin and tonic. It has a sweetness and lime note that’s a bit too overpowering, but it’s not too bad. I can see why people would drink this. Ready built to pour into a tonic with ice, it’s a satisfying G&T that’s easy to drink. Martini and beyond is where this sort of lost of me. I didn’t think the martini added a ton to the picture. The herbal sweetness and dryness was lost in a torrent of lime. 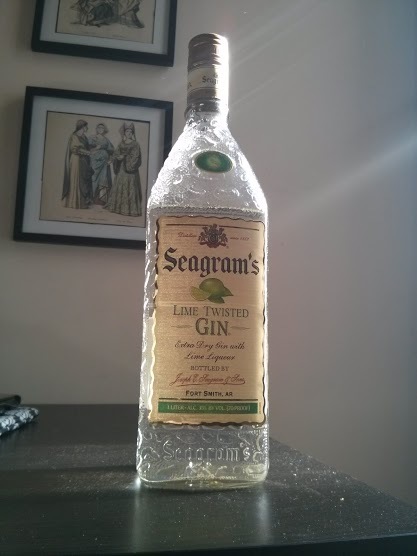 It was certainly easy to drink- Seagram’s Lime Twisted Gin is only 70 proof. But overall, I have to confess, I preferred the gin neat to the way it mixed with the Vermouth. But the flavor clashes found in the martini were only amplified as you roared through your cocktail cabinet. In a Negroni, the sweet lime note just felt out of place, although it was more subdued than I had initially expected. You can certainly whisk your way through other cocktails, and I found them to be mostly discordant, as that is not the market Seagram’s gin is going for. It’s aiming to be mixed with lemonade, tonic, sour mix. Not necessarily creme de violette or Campari. For what it does, Seagram’s Lime Twisted Gin is okay. It makes a decent gin and tonic, that although it may not necessarily be to my taste, it’s not bad in this way. I’d say for the price, it’ll do for a party. But not if you’re going to be inviting any serious gin drinkers. For that I’d suggest looking elsewhere. This gin made me feel really ill, after the first glass. I don't know what it was, but it gave me really bad headaches etc. Has anyone else had this reaction? I normally like Seagrams gin a lot....the flavouring ingredient seems to not agree with me, i assume it doesn't agree with other people? I have been a fan of this product for years and usually purchase it by the half gallon. Recently, I had the unfortunate experience of opening a very bad bottle. It tastes terrible when mixed with tonic and even worse when used with other mixers. My liquor store tells me that this is the first they have heard of a possible bad batch. Has anyone else had this experience?